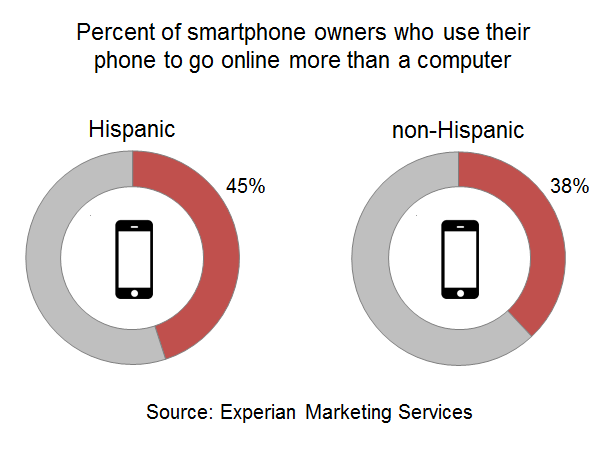 Hispanics are mobile-dominant. Are your campaigns? 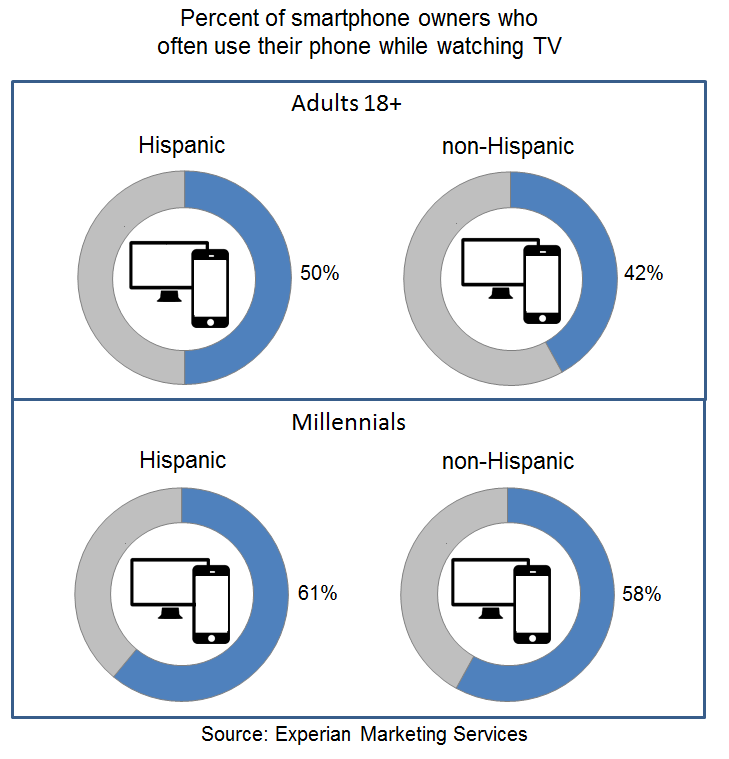 Experian Marketing Services conducted an analysis into the attitudes, language preferences, spending habits and media behaviors of Hispanic Consumers, some of which were featured in the 2014 Hispanic Market Overview presented by López Negrete Communications. This post highlights findings from that analysis, which focus on Hispanic consumers’ adoption and use of smartphones. Hispanic consumers, who today account for 15 percent of the total U.S. adult population and 22 percent of Millennials, represent an ideal audience for mobile engagement and mobile advertising. While cell phone ownership rates among Hispanic and non-Hispanic adults are equal, Hispanics are more likely to own a smartphone and use it as their primary device to connect to the Internet. According to the latest estimates from Experian Marketing Services, 63 percent of Hispanic adults own a smartphone versus 60 percent of non-Hispanics. That’s up from 52 percent and 51 percent, respectively, since 2012. Among smartphone owners, Hispanics are 17 percent more likely than non-Hispanics to say that they access the Internet more through their phone than through a computer. In fact, 45 percent of Hispanic smartphone owners are mobile-dominant when it comes to going online compared with 38 percent of non-Hispanics. Marketers courting the influential Hispanic consumer must consider this fact and take a mobile-first approach to ensure that online marketing efforts, including everything from email to websites to e-commerce, are designed to engage the customer as effectively on a mobile device as on a computer. Even traditional marketing tactics such as television ads should reflect the growing likelihood that Hispanics have a smartphone either nearby or physically in their hand and are ready to engage. In fact, 37 percent of all Hispanic adults say that they often use their cell phone while watching television compared with 29 percent of non-Hispanics. Among smartphone owners, the share of Hispanics who use their phone while watching television shoots up to 50 percent versus 42 percent of non-Hispanics. Millennial smartphone owners are among the most likely to be splitting their attention between the big and small screen with 61 percent of Hispanic Millennials and 58 percent of non-Hispanic Millennials doing so. 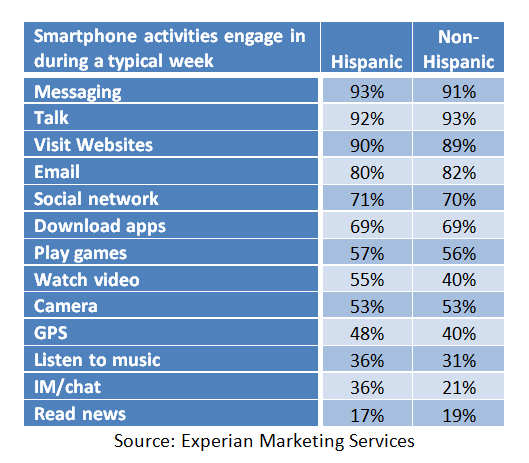 Knowing what specific mobile activities Hispanics are engaging in is critical for marketers in identifying the best tactics for reaching them via mobile. The chart below shows that Hispanics engage in most smartphone activities at above average rates, but they are much more likely than non-Hispanics to IM/chat on their phone. As a result they are slightly less likely than non-Hispanics to email from their phone, though the vast majority of Hispanic smartphone owners still use mobile email. Other activities that marketers will find Hispanics engaging in at above average rates include watching videos, using mobile GPS and listening to music. Learn more about how Experian Marketing Services can help your organization more effectively target, reach and engage today’s Hispanic consumer.